“Static-dynamic” trait reveals itself in human behavior, in his speech, features of facial expressions, movements, handwriting and drawing, in the specific perception of the world as a whole. But for the purposes of determining the socionic type it is important to single out the markers of this trait in the picture. In search of characteristic markers there are compared works of the masters of Japanese prints Hokusai and Hiroshige, and European graphic artists. In the final part of the work the discovered patterns are illustrated with numerous examples of the performing drawing tests by representatives of different socionic types. Key words: socionics, socionic type, statics, dynamics, determination of type, drawing tests, graphic arts. The problems of types with a low-dimensional “ethics of relations” are considered. Recommendations are given on the proper use of the resources of this mental function for building harmonious relationships with others. Key words: socionics, ethics of relations, relationships, personality type, gender stereotypes. 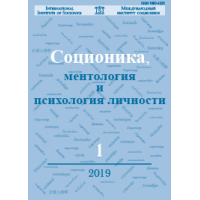 It is a description of observations of the operation of the SLI model, using theories: the dimensions of functions (by Bukalov A.V. 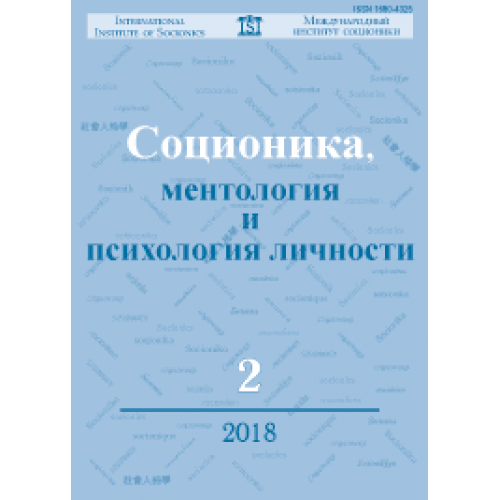 ), signs of functions (by Gulenko V.V. ), controlling emotions (by Pyatnitsky V.V.). Key words: socionics, A-model, sensory-logical introvert, dimension of functions, signs of functions, controlling emotions, self-observation. Minaiev Yu.P., Datsenko I.P., Statiev V.D. The 35-element set of tetrachotomies of the socion (by Reinin) is analyzed from the point of view of the group of classical intertype relation operators (by Augustinavichiute). Concepts of «homogeneous» and «inhomogeneous» small groups (by Reinin) are discussed. Key words: socionics, classical intertype relations, groups of central sections of socion, bipolar traits, Augustinavichiute‒Reinin traits, Jung‒Minaiev traits, «trait-based» intertype relations, «homogeneous» and «inhomogeneous» small groups. The correlation of the concepts of socionics and psychosophy is considered. It was concluded that socionics and psychosophy can not be regarded as correlating systems. Key words: socionics, psychosophy, logic, ethics, intuition, sensorics, physics, will, emotion. Key words: person, feelings, emotions, maturity, family. 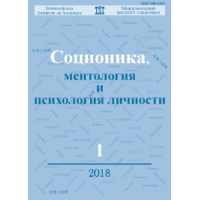 Issue # 1/2018 of “Socionics, mentology and personality psychology…” journal Rese..
Issue # 3/2018 of “Socionics, mentology and personality psychology…” journal Rese..
Issue # 4/2018 of “Socionics, mentology and personality psychology…” journal Meth..
Issue # 5/2018 of “Socionics, mentology and personality psychology…” journal Rese..
Issue # 6/2018 of “Socionics, mentology and personality psychology…” journal Rese..
Issue # 1/2019 of “Socionics, mentology and personality psychology…” journal Res..